Eloquent and audacious, Collision FX cinematic scoring tool is a sound design supercharger with everything you need to create cinematic elements that truly express the sonic emotion in your audio productions. Straight up, out of the box, start with the Collision FX unconventional palette of sounds and use the built in 234 NKIs, handcrafted and created by expert sound designers, audio engineers, and musicians for adding film and AAA game style cinematic elements to your mix or score in moments. 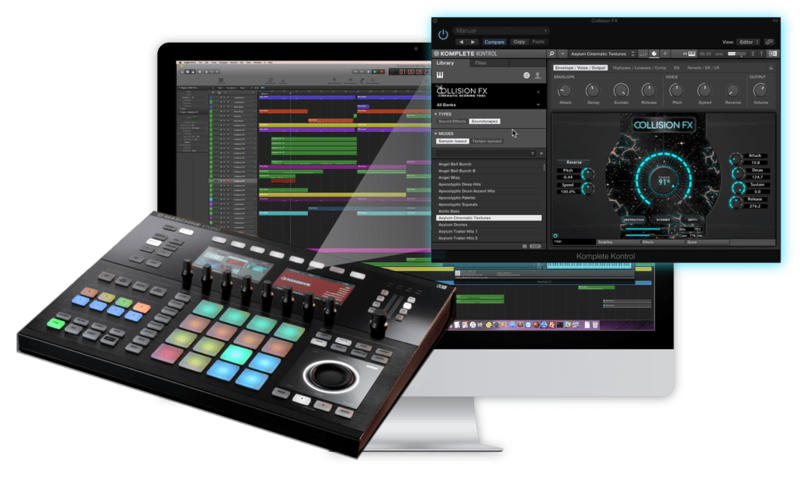 Kontakt Plugin for Native Instruments Kontakt Player, Maschine and Native Instruments NKS ready devices. Extremely useful, beautifully recorded, and very cost effective! I’m intrigued by this plugin. I bought it for some sound design and remix work and it’s much much deeper than I expected. It will take me a while to dig into its entirety, Totally worth the $$$. The first sample I triggered was a sure sign that this entire library was going to be insane. The deeper I dug, I realized I had completed at least 3 pieces of trailer music/sound design in half the time it takes just digging for sounds. This library is now a “go to” when it comes to any Hybrid work, or for even a quick spark of inspiration. Absolutely a must have!!! I’ve used Collision FX on multiple films. 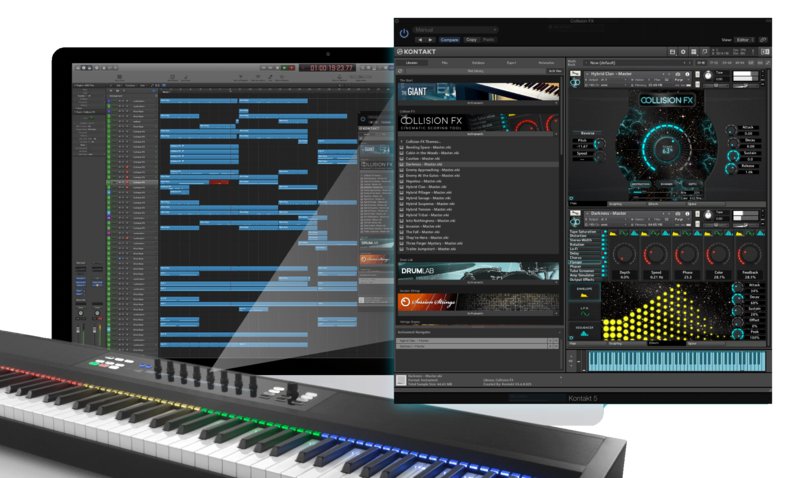 It’s a great tool for any film composer to give their score that big budget sound. If I’m ever short on ideas or I don’t know how to approach a scene, Collision FX is my weapon of choice. Just build a foundation to the score, and reach another level. With so many sounds and textures you won’t ever lose your creative edge. Whether it’s for film scoring or writing for Underoath, I don’t have another tool that’s as versatile as Collision FX. I love the easy sidechaining, insane reverbs, and with the insane amount of samples included, I don’t think I’ve even scratched the surface. Damn. The Collision FX is absolutely a brilliant library! Excellent & well-designed Kontakt interface, easy and fast to use. all presets and sounds manipulation options are superb and endless, deep & creative! It’s just amazing how SOUND YETI gets to create all those amazing sounds and textures! Be prepared to be pleasantly surprised! Highly, highly recommended! This KONTAKT library provides endless inspiration for starting tracks or to just add that sprinkling of fairy dust to bring a track together. If you haven’t got this library then what are you waiting for … buy it. …There are some rich and powerful sounds possible with this instrument and it seems particularly suited for scoring trailers and action sequences. I will be using this awesome new program to further my sound and production level… This program looks so futuristic… can’t wait to play around with it and see what I can make! After listening to the sound demo’s of Collision FX, it seems that Sound Yeti has created an awesome instrument full of innovation that will be an inspiration for years to come. Thank you Sound Yeti, I can’t wait to play Collision FX, and break some new sonic barriers! Collision FX is great Good stuff. I don’t need another orchestra. Coin-Operated sound packages need big stuff and Collision FX meets that criteria. Collision FX has a great library full ambiance, hits, rises, falls, you name it! 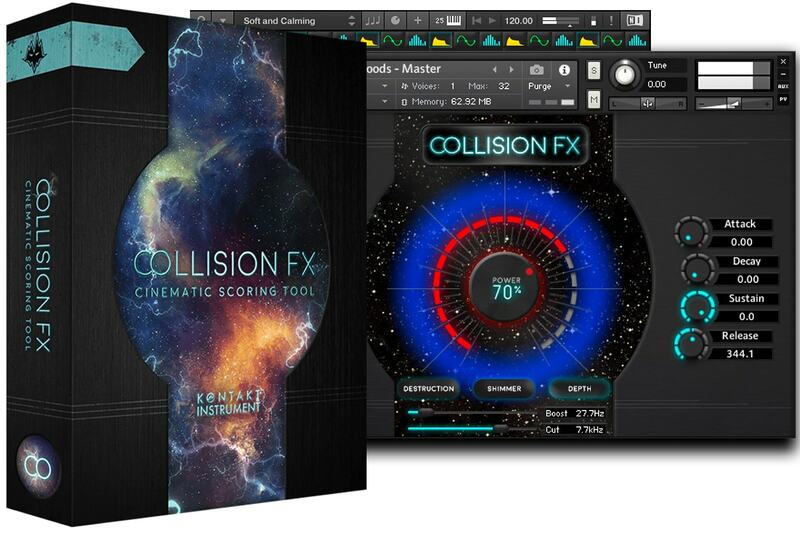 Whether you are looking for subtlety or grinding action within the mix, Collision FX can deliver. Collision FX gives users the potential to create ethereal impacts and morphing ambient soundscapes with great ease. Cutting edge toolbox! Complete perfection! Collision FX is a collection of High-Quality hybrid scoring sounds with an easy to use interface that any Composer or Sound Designer would benefit in having in their sample libraries.